Length of Unemployment Continues to Rise; 4 in 10 have "Given Up"
Despite increasing job vacancies and record low unemployment, Canada's jobless find it harder to find work. The length of unemployment in Canada continues to rise and the number that have "completely giving up" is back up. These are the findings of the fifth annual survey of the unemployed in Canada, commissioned by Express Employment Professionals. Despite today's decades' low 5.8 per cent unemployment rate (Statistics Canada, Labour Force Survey, May 11, 2018) the unemployed express greater levels of resignation compared to last year's survey. The average duration of unemployment continues to rise, now at 19 months, the highest level recorded by the survey in five years. The national survey of 1,510 jobless Canadians age 18 and older was conducted online by The Harris Poll between March 28 and April 10, 2018, on behalf of Express and offers the only detailed, in-depth look at the background and attitudes of the unemployed in Canada. "Our survey of the unemployed shows there is a growing jobs disconnect in Canada. 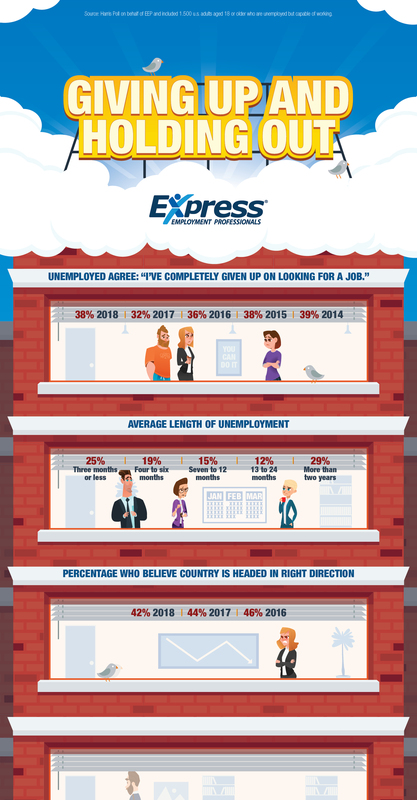 The number of 'Help Wanted' ads continues to rise, yet the jobless are giving up and staying unemployed longer," said Express CEO Bill Stoller. "Rather than decreasing, barriers to re-enter the labour force appear to be increasing." There are currently 1,555,000 unemployed in Canada. The latest Statistics Canada numbers show year-over-year job vacancies up in nine of Canada's 13 provinces and territories in the fourth quarter of 2017. There are just under 500,000 job vacancies nationwide. The labour force participation rate in Canada remains stubbornly low at 65.4 per cent. The population of the long term unemployed is increasing as fewer Canadians have indicated that they have been unemployed for three months or less (25 per cent in 2018 vs. 28 per cent in 2017), while more Canadians have said they have been unemployed 24 months or more (29 per cent in 2018 vs. 26 per cent in 2017). These negative trends have led to lengthier periods of unemployment as the average length is more than 6 months longer than it was in 2014. The unemployed reported that they are putting less effort into looking for work, or an average of 12.3 hours looking for work last week (at the time of interviewing). That is down from 13.4 hours in 2017 and 14.9 hours in 2016. Thirty-eight (38) per cent of the unemployed agree with the statement, "I've completely given up on looking for a job," compared to 32 per cent in 2017, 36 per cent in 2016, 38 per cent in 2015, and 39 per cent in 2014. In the survey, unemployed Canadians listed reasons why they left their last job and what they see as the barriers to employment. Some of these include a perception of ageism against older workers, work place and other injuries, health and medical issues, seasonal work and stigma against those with little experience. Some also cite child care and elder care challenges as barriers to their employment. Over halfway through Prime Minister Justin Trudeau's mandate, a picture is emerging as to how the unemployed feel the government is moving. Six-in-10 (58%) of unemployed Canadians feel the government is moving in the wrong direction. Reinforcing this pessimistic assessment, only two-in-10 feel the Trudeau government has had a positive impact on creating jobs (22%). This is down significantly from opinions gathered in 2017 (34%). Half now say that the Trudeau government has had no impact on creating jobs (47%). Notably, unemployed Canadians hold similar feelings over their provincial governments as only two-in-10 feel they have had a positive impact on creating jobs (20 per cent vs. 21 per cent in 2017 and 24 per cent in 2016). Similar to views about the Trudeau government, half of the unemployed believe that the provincial government has had no impact at all on creating jobs (50%). Who are the Unemployed in Canada? According to the survey, 56 per cent of the unemployed are men; 44 per cent are women. This study was conducted online by The Harris Poll on behalf of Express Employment Professionals and included 1,510 Canadian adults aged 18 or older who are unemployed but capable of working (whether or not they receive unemployment compensation benefits). Excluded are those who are currently retired, choose to stay at home, or are unable to work due to long-term disability. The survey was conducted between March 28 and April 10, 2018. Results were weighted as needed by gender for age, education, race/ethnicity, region and household income. Propensity score weighting was also used to adjust for respondents' penchant to be online. Totals may not equal the sum of their individual components due to rounding. No estimates of theoretical sampling error can be calculated; a full methodology is available. Download an infographic for the release. If you would like to arrange for an interview to discuss this topic, please contact Kellie Major at (613) 222-7488 or email kellie@mapleleafstrategies.com . Express Employment Professionals puts people to work. It generated $3.4 billion in sales and employed a record 540,000 people in 2017. Its long-term goal is to put a million people to work annually. For more information, visit ExpressPros.com/CA. The Harris Poll is one of the longest running surveys in the U.S. tracking public opinion, motivations and social sentiment since 1963 that is now part of Harris Insights & Analytics, a global consulting and market research firm that delivers social intelligence for transformational times. We work with clients in three primary areas; building twenty-first-century corporate reputation, crafting brand strategy and performance tracking, and earning organic media through public relations research. Our mission is to provide insights and advisory to help leaders make the best decisions possible. Learn more at www.theharrispoll.com and follow The Harris Poll on Twitter (@HarrisPoll) .